Keywords play an important role in Search Engine Optimization(SEO) and they should be used properly to get maximum utility. Cost per click (CPC) of the keyword. Low/ medium overall competition (You can go for high competition keywords if your site is well optimized and ranks high). Keywords that have good search volume. High commercial intent (number of people looking to buy the product/service for a particular keyword). In this article, we’ll discuss some of the valuable places where you can strategically use your keywords to boost your SEO. Meta title is the most crucial factor that impacts the search engine rankings. It is the first element that a viewer sees in a search result. Therefore it is essential to include your primary keyword in the title to give a good impression to the visitors. Google typically displays the first 55 to 60 characters of the title tag or as many characters as possible in a 512-pixel display. So keep your titles crisp and include target keywords in a captivating way to compel the visitors to check out your content. Writing a small snippet about a web page rich in keywords constitutes a good meta description. Since it appears just below the meta tag, it is necessary to optimize the content to be SEO friendly. Though it doesn’t directly affect the search engine rankings, it affects the click-through rate (CTR) and bounce rate. 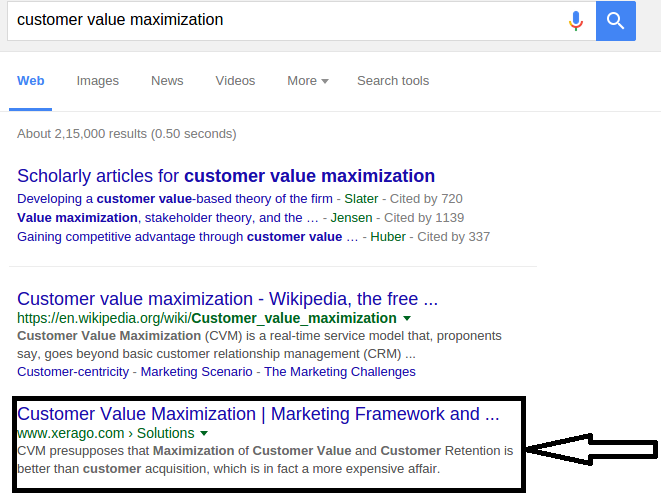 Xerago’s Customer Value Maximization meta description perfectly includes the main keywords and limited to 160 characters. Search engines generally truncate the descriptions longer than 160 characters. So it’s a good practice to limit the descriptions between 150 to 160 characters to give full visibility to your content. You can target secondary keywords with a proper description of page content. A meaningful and keyword rich meta description will feature well in the SERPs and will improve site’s reputation. Placing keywords in the URL structure is a good way to boost relevancy of your webpage. This helps the viewers to understand about the page content. Viewers find links with descriptive terms more authentic, so including keywords in the directory filenames will be beneficial. Below is an example of keyword inclusion in URLs. By looking at the above link, one can clearly see the directory names with keywords. Page relevancy is highly determined by the keywords present in the links, and that explains the importance of including them. Nevertheless, care should be taken not to stuff keywords for the sake of it. Creating title of every page in a website using the <H1> tag is a good practice as per SEO guidelines. This is the page title which the viewers will see when they visit your website. The key is to include primary keywords in the title and make it catchy. If you’re writing a long article, make sure you use other header tags ( <H2>, <H3> etc). Split the content into subheadings and target the secondary keywords in <H2> or <H3> tags. This way you can present your content in a logical flow. There is no two opinion that the body text will contain keywords. Make sure you weave the keywords naturally into the body. Also, don’t manipulate the keywords – there is little chance that you might actually score against the mighty search algorithms. Bottomline, quality and relevance towers above keyword density any day. How often have you searched a particular image and landed on the site hosting the image? Image search has opened new avenues for SEO and it has the potential to drive traffic to your site. There are a number of factors that help an image to rank in image search. Text surrounding the picture in the webpage provides the context and relevancy for the keyword search. Alt tag is also a factor in image search. They provide the vision to Google bots to look through the images on a website. Therefore including keywords in the Alt tags is a good practice to describe the image in a SEO friendly way. Use keywords in the alt text, but make sure they are descriptive and helpful. Keywords that you’re using should be short and brief. Use ‘longdesc’ attribute in alt tags to help the visually impaired understand your images. Never misuse your keywords by stuffing them as it might end up hurting your SEO rather than helping. A webpage with long text and zero images is never interesting. To improve its appeal, you ought to include relevant images to support the content. 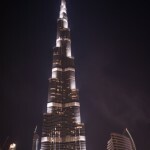 Below is a night view image of Burj Khalifa, Dubai. There are millions of images out there for Burj Khalifa. But how will you rank this picture in search results? Having a generic image name like ‘burjkhalifa.jpg’ doesn’t provide description of the image and it will be tough to compete in the image rankings. 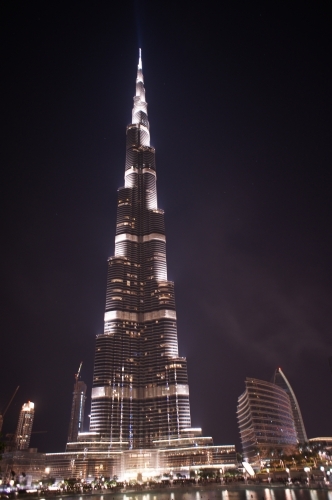 Instead, the image name ‘burjkhalifanight.jpg’ does a better job of providing a description to the image than the generic name. Always try to provide a description in the image name which is relevant to the page content. Breadcrumbs or Breadcrumb navigation are a set of contextual links that work as a navigation tool for a website. On most websites, a breadcrumb trail is placed below the navigation bar. Home -> Category -> Current Page. Breadcrumbs provide a great potential for SEO activities. You can target your keywords by including the keyword rich page titles for the links. Care should be taken to follow the same directory structure as mentioned in the URL. Placing keywords in breadcrumbs is useful but search engines always weigh usability more than the number of keywords used. So when you use keyword rich breadcrumbs, make sure it makes sense! So we have discussed some of the important areas for keyword placement in a webpage. If you have any questions or additional points to add, let us know in the comments section below.